Barbara Adamczyk, born in Poland, began her music education at the age of 8 studying piano. In 2000 she graduated with distinction the secondary music school in piano playing. 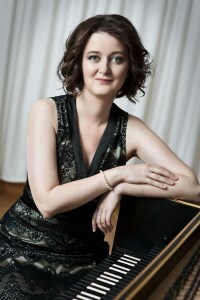 At the same time she discovered her passion for the harpsichord and started harpsichord studies at the University of Music in Katowice under prof. Marek Toporowski, she obtained her diploma in 2005. In 2007 she graduated harpsichord in Trossingen under prof. Marieke Spaans. She has attended master classes with Christian Rieger, Lars Ulrik Mortensen, Jesper B. Christensen, Christine Schornsheim, Bart van Oort. Since 2008 Barbara has been working as an accompanist at the Staatliche Hochschule für Musik Trossingen in the Early Music Department. In 2012 she gave master class on French harpsichord music and French style by J.S. Bach within the scope of Süddeutche Orgelakademie 2012 in Weissenau. She plays in “Trio Cammerton” which was chosen as one from six ensembles for the International Young Artist Presentation of AMUZ Festival van Flaandern Antwerpen in 2012. She performs at concerts all over Europe and accompanies numerous courses and competitions.